What is the most important aspect of playing cricket? Well, views will differ but many people will be delighted to read a whole book devoted to a vital aspect of a match which contains absolutely no play. Teas have long been an imperative part of the game and many a devoted partner/wife has given up their time to provide a good spread in the late afternoon. Peter Baxter, former producer of Test Match Special, is the ideal man to write a foreword given the number of cakes sent to their commentary boxes. Matches and clubs can become memorable to opposition players not necessarily for the quality of the play but more importantly the tea. It reminds me of a home ground where the chap who made the teas, a man who had a passing resemblance to Mick Jagger, thought that we were taking the mickey when we congratulated him upon his bread pudding. It was heavenly and had everyone fancying fielding in the slips afterwards. After reading Phil McCann's amusing, anecdotal book, I can see that our club was not alone. Many people have been consulted for Cricket Teas and there are a few famous names amongst them including Sir Michael Parkinson and Michael Vaughan. Club cricketers have also had their say and whilst we may laugh now at the tale of the dog which devoured most of one club's Saturday afternoon tea, let's not forget how the teams felt at the time. 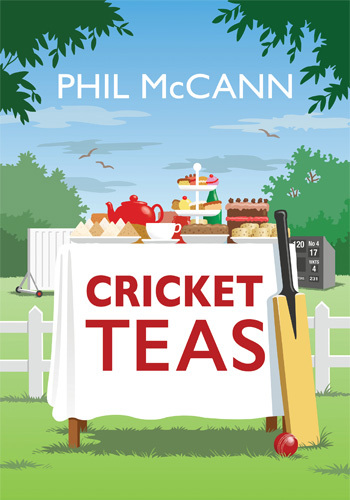 Times have changed and I suspect that the banana sandwiches which I foisted upon the players twenty-odd years ago would be tolerated even less these days... Well done to Phil McCann for writing such a fun book and all those good people who give up a good chunk of their weekends to feed cricketers.